DO NOT REDISTRIBUTE / MODIFY / OR CHANGE (for 3rd party purposes) any parts of “UHD Mesh Scenery v1” without asking for permission in advance (usually I allow almost everything, but I like to know about it!). Statement about the compatibility with X-Plane 11. UHD Mesh Scenery v1 will be fully compatible with X-plane 11 and can simply be moved from the old X-Plane 10 “Custom Scenery” environment to the new X-Plane 11 “Custom Scenery” environment. You only need to make sure, that in the new X-Plane 11 scnery_packs.ini the ordering remains correct (as recommended in the installation instructions). Japan – new since April 2016! The general characteristics of UHD Mesh Scenery v1 are identical to those described in HD Mesh Scenery v3 (please read all the details by following the link). 30m resolution DEM elevation data instead of 90m DEM data. (once more) massively increased mesh density … by roughly factor 2.5 to 3! This is not only beneficiary to the better representation of the higher res DEM data, but also – once more – improves landclass and forest detail. Canadian Rockies, Scandinavia and Pyrenees use OSM data based around end of April 2015! Japan uses OSM data based around mid March 2016! Because of this, the UHD Mesh Scenery v1 Scenery is very heavy on hardware resources and will only run smoothly on modern, higher end PCs. See the warnings in the following section. Your X-Plane 10 FPS might become very low (if you already have FPS problems with HD Mesh Scenery v3, then this will not improve your situation!). UHD Mesh Scenery v1 increases the pressure on the GPU by adding a lot more mesh to be rendered! You need at least 16 GByte of RAM to enjoy this scenery (and this is no joke, it is a very serious warning)!!! And if you want to play it safe, you better have 32 GByte of RAM! Especially with the new, “extended DSF” feature since X-Plane 10.40, the RAM requirements can even double (because this feature loads twice the number of DSF files to make long range visibility possible)! Do not even think of using X-Plane 32bit! Do not download, if your hardware is struggling with HD Mesh Scenery v3! Tip: the least “heavy” areas are the Arizona / Nevada (yes, where the Grand Canyon is) region, because there is not much more than a complex mesh to be rendered (almost no urban area, very few roads, little forests – all of this add massively to the GPU load). So, if you are unsure, you should start with those (they need the least RAM, and are lighter on the GPU – on my higher end PC I could reach 50 FPS there even with high rendering settings)! Not planned at the moment, but maybe www.fspilotshop.com will offer some DVDs. Create a Subfolder called “Earth nav data” in your zzz_uhd_global_scenery1 folder. Here, its very important to name it EXACTLY – without the quotes – “Earth nav data” and don’t make any typos (it is also case sensitive)! After you have uncompressed the ZIP file(s), put the resulting scenery folders (they should have names like +30-110,+30-120,+40+010 etc.) in the previously created (sub)folder “zzz_uhd_global_scenery1/Earth nav data“! Some areas (Sierra Nevada / Arizona – Nevada / Colorado) have identical folders (they overlap on a 10×10 degree grid), but different files. So dont worry, and just let those folders being “put together” by your file manager (usually it will ask, if you will put files in an existing folder … you can confirm this). Now you can continue with the scenery_packs.ini section if this is your first UHD Scenery Mesh v1 package! Otherwise (if you correctly edited the scenery_packs.ini previously) you can now start flying. This part is very important! If you do not do this, you will very likely NOT see any of your other add-ons (airports etc.) in a given region anymore! The reason is, that a “base mesh scenery” (which the UHD Mesh Scenery v1 is) forms the base of your landscape and only layers above it will be rendered! Anything below the base mesh layer will not even be loaded. After some time, it turns out, that more often than I thought (or hoped), people have a broken installation and do not see/use HD Mesh Scenery (even if they think so). There is a very easy and straight forward way (other than obvious or less obvious visual cues) to check, if X-Plane is really loading the UHD Mesh Scenery v1 (and thus, your installation was correct). After a – hopefully – correct installation and correctly setting up scenery_packs.ini (see above) start X-Plane at a location where you have added UHD Mesh Scenery v1 coverage (of course, it makes no sense to check where you do not have it)! Search for text like “zzz_uhd_global_scenery1” (or the EXACT name you called the installation folder inside “Custom Scenery”). If you find multiple lines, which look like “DSF load time: 20506020 for file Custom Scenery/zzz_uhd_global_scenery1/Earth nav data/+40+010/+46+013.dsf (3314511 tris)” (of course, exact dsf file name, and numbers will vary depending on the place you loaded up) then everything is OK! X-Plane is indeed loading DSF (Scenery) files from you UHD Mesh Scenery v1 installtion. If you do NOT find any such line mentioning loading UHD Mesh Scenery v1 DSFs (with “DSF load time …. for file Custom Scenery/zzz_uhd_global_scenery1/Earth nav data/ …”), then something went wrong and you should carefully re-read the installation instructions! If in doubt, please look at the small coverage maps included in each ZIP file, which show you exactly, where you can expect UHD detail and where not! Spikes or deep trenches might appear in very rare cases. There is not much I can do about is, as this is either because of some rare elevation DEM data errors (which might “get” fixed only if i – one day – can get hold of newer/better such data), or because the scenery generator itself messed up parts of the landscape as it was pushed far beyond the limits of its originally intended use (and design). Such spikes have been seen for example at the souther end of the Sierra Nevada. And one trench is known to exist “in the riverbed near Saint Auban in the Alpes / Provence in France”. Some DEM resolution issues in Canada West package. Approximately beginning on the eastern parts of the Canadian Rockies the DEM data quality drops a little bit, thus having less detail than most other UHD areas. I have researched this in depth, and it turns out that both in the NED 1sec data (I used here) and in the original CDEM data (which is obviously the source in the Canadian NED coverage) this issue is apparent. I even tried replacing some tiles with SRTM 1sec data, but currently available SRTM 1sec tiles in Canada still have their own data quality issues (with big data holes in the mountains) … which would have been an even worse trade off. Bumpy airports. A lot of airports tend to be more bumpy than they should be. Some investigation showed that this is the result of a mixture of very high mesh resolution (tiny triangles) and only having 1m accuracy in the raster elevation data included in the DSFs (which comes of the simple integer nature of that data). This then can introduce “too big” steps (at least 1m) over too short distances. In the meantime I identified a setting in the scenery generator which can help make the triangles at airports bigger, thus “spreading out” elevation changes over longer distances. So, this might help in future UHD releases (IF they come at some time). UHD Mesh Scenery v1 – FINAL (all screenshots come in pairs – they are comparisons between UHD and HD quality! The first of each pair is UHD, the second HD – but there are also caption for each picture to make this clear). I do NOT have 30m elevation DEM data for all areas of the planet (but this might still improve in the near future, as some new sources come online this year). Definitely not ALL regions make sense at UHD resolution. Usually, only mountainous areas are worth the extra GBytes of data (and added workload on the hardware). And of course, the “default” argument about Landclass, which I wrote about in HD Mesh Scenery v3 holds still true (which you can read about by following this link). Nevertheless, its not impossible, that I will extend the UHD Mesh Scenery coverage in the future. BUT PLEASE DOT NOT ASK FOR REGIONS … Usually, I will decide this depending on data availability, quality, time etc. on my own to my best knowledge. Everything else is identical to HD Mesh Scenery v3 (read about it by following this link)! Expect that newer regions (July 2015) have newer OSM data, from around End of April 2015. 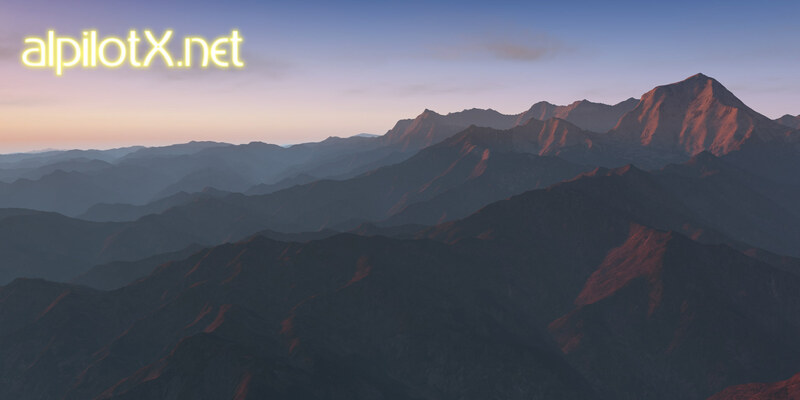 Just like with HD Mesh Scenery v3 (find out, by following this link).